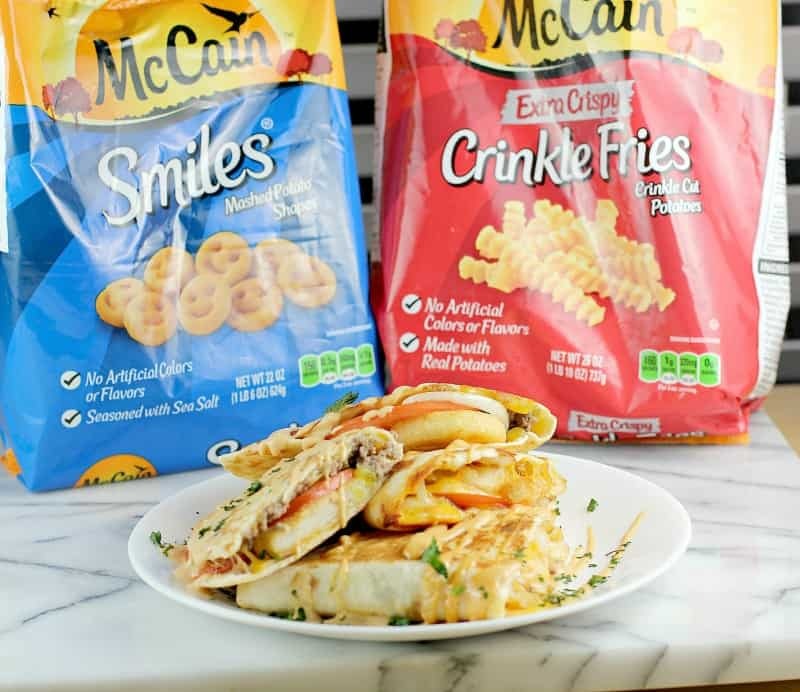 Until 5/31/19, you can get $1.50 off when you purchase 2 participating McCain® products at Walmart. You can submit your rebate & learn more details here. 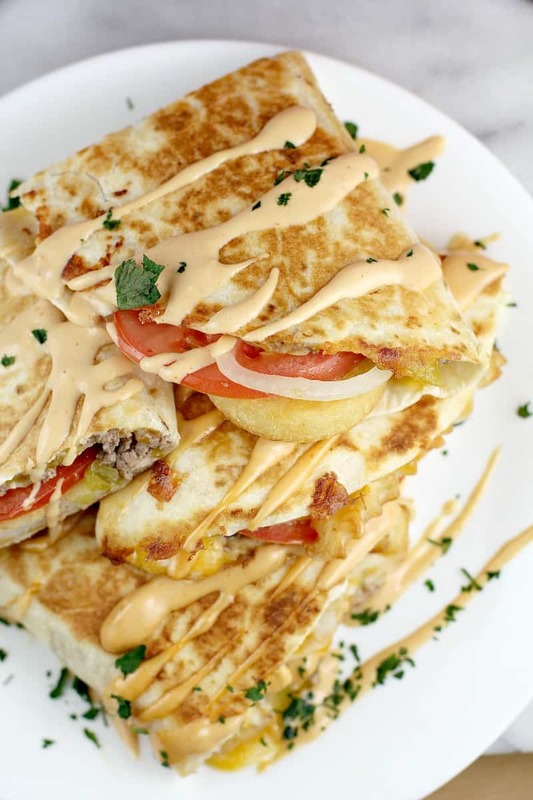 Ground beef, pickle, onion, tomato, french fries and plenty of cheese served in a toasty quesadilla tortilla and finished with homemade burger sauce. ….because we are a all-about-football food-family. And lately my son has been into basketball too, so we can add that into the mix. I made this on a weeknight for dinner (yes, really). This burger quesadilla went over HUGE. The 8 year old loved it. He was hilarious – he literally closed his eyes munching down his first bite. He gets this funny, literally-in-Heaven face when he eats something really good, and he brings that out for me because he likes to make me feel good by enjoying my food. Then when I told him there was pickle in it, he paused, thought about it, took another bite, thought about it some more, and declared that in a cheeseburger and fries quesadilla, he likes pickles. But nowhere else in the world lol. 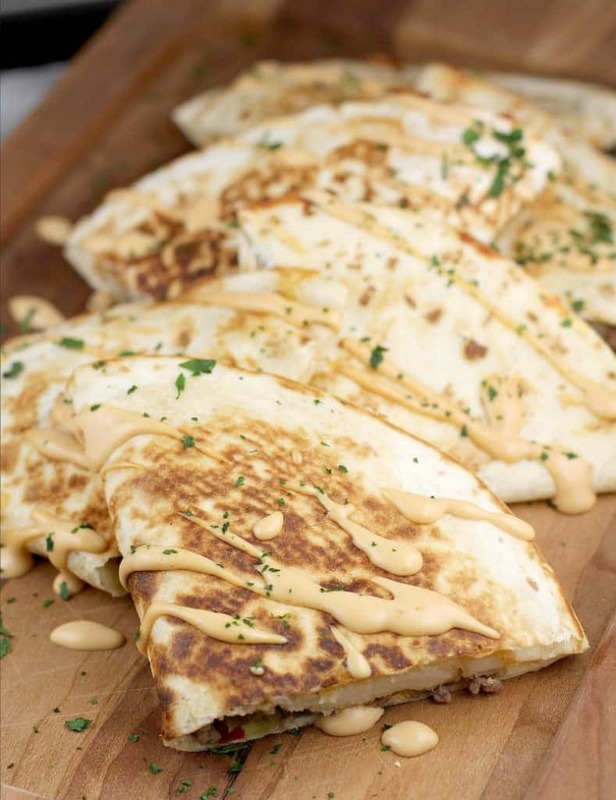 With cheesy filling in a crispy tortilla, quesadillas strike a perfect balance of textures. We can change up the filling however we want to keep things interesting. 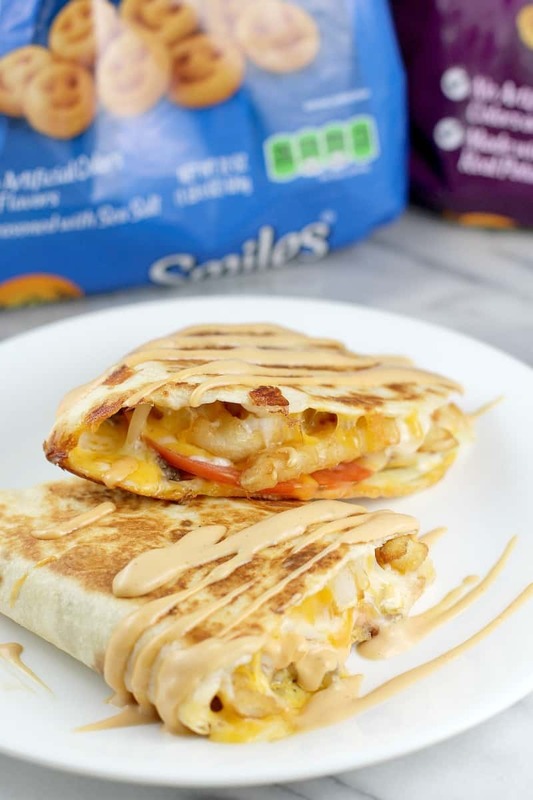 Quesadillas can be made healthy (like using a great filling and cooking spray) or indulgent. 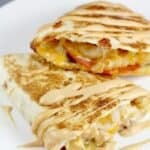 You control your quesadilla! Quesadillas are an easy dinner or snack. Omelets are too, just saying. 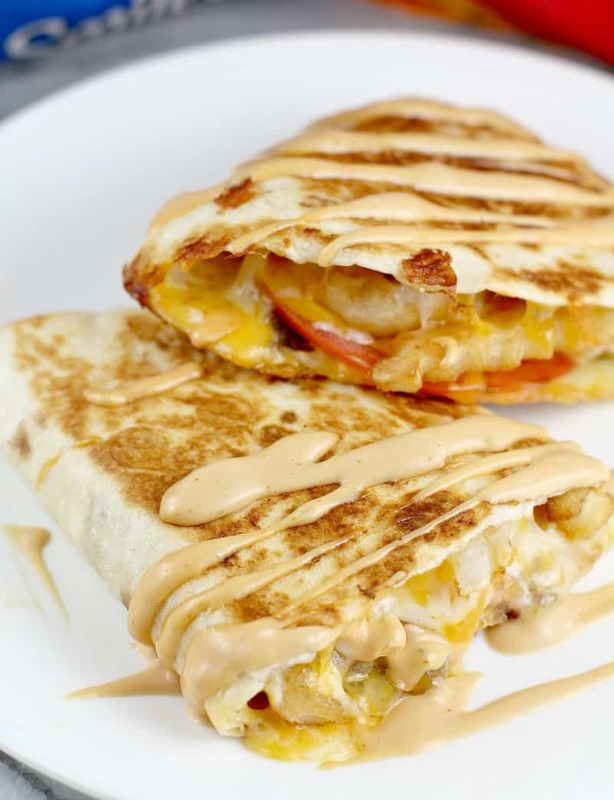 Quesadillas are a fantastic way to use up all your little bits of leftover cheese. Or pretty much anything else. 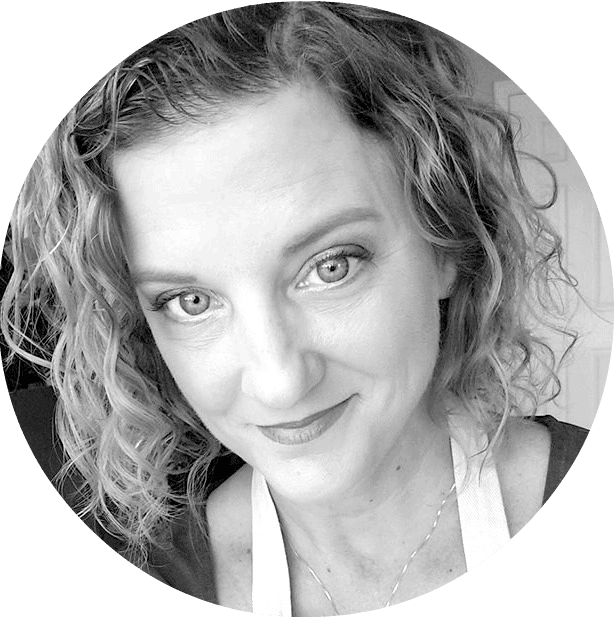 Well, if quesadillas are so great Erica, why is this just your 3rd recipe for one?? Because when I make quesadillas, it’s usually with just deli meat and cheese honestly. It’s an easy weeknight dinner for me on the regular. Also, quesadillas are spectacularly difficult to photograph just saying. All flat foods are. But this is fun food intended for gatherings and game-day and such right? Or just a fun weeknight dinner, what evs. If you don’t know, McCain Foods is an international company originating from Canada and the world’s largest maker of all things frozen potato. Think thick fries, thin fries, crinkle fries, curly fries, mashed potato fries that smile at you, and tots. 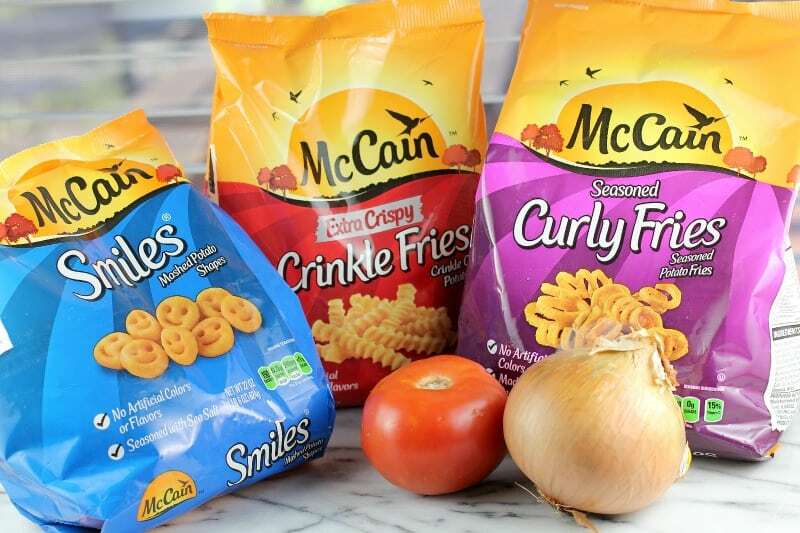 McCain is a household name in the UK, and they want to bring that love here to the US. Can’t blame them. Since I had the opportunity to work with McCain frozen potatoes, I wanted to do something FUN. Life has been down lately, lots of struggles and such, and I literally just wanted to create a fun recipe, completely different from my usual. This is one loaded up quesadilla! 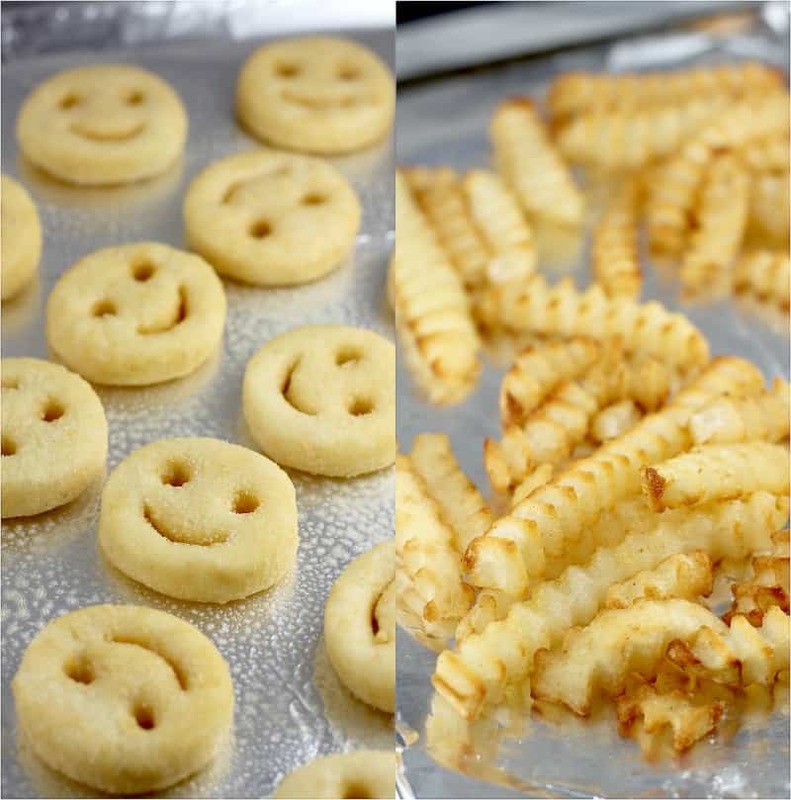 I chose the Smiles Mashed Potato Shapes and Extra Crispy Crinkle Fries because I knew both would work for my recipe idea. The kids loved the smiles. I appreciated the texture the crinkle fries delivered. Then I cooked the curly fries separately, but still dipped them in the burger sauce YUMMM. This is a loaded quesadilla, but we still want to go not too too overboard with toppings because that would be crazy and hard to flip. Layer the cheese first, middle, and last, because the cheese is the glue and key to life of this recipe. Pile the filling ingredients on one side of the tortilla in the pan, use thongs to pull the other side of the tortilla over, then rubber spatulas to flip. To make the tortilla toasty, use cooking spray in a nonstick pan. Butter or olive oil would work as well. Burger sauce is that creamy, pinkish orange sauce you see a lot at takeout places. To take out all the guesswork, I made my own but you can skip this and purchase if so desired. 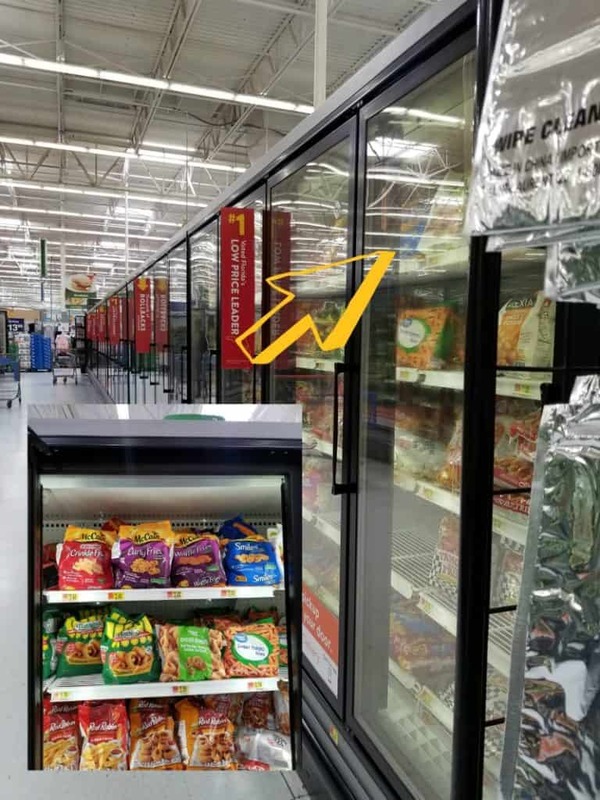 Just look in the condiment aisle at Walmart for one of the following: burger sauce, mayochup (I recommend adding a little horseradish to this), secret dipping sauce, or fry sauce. 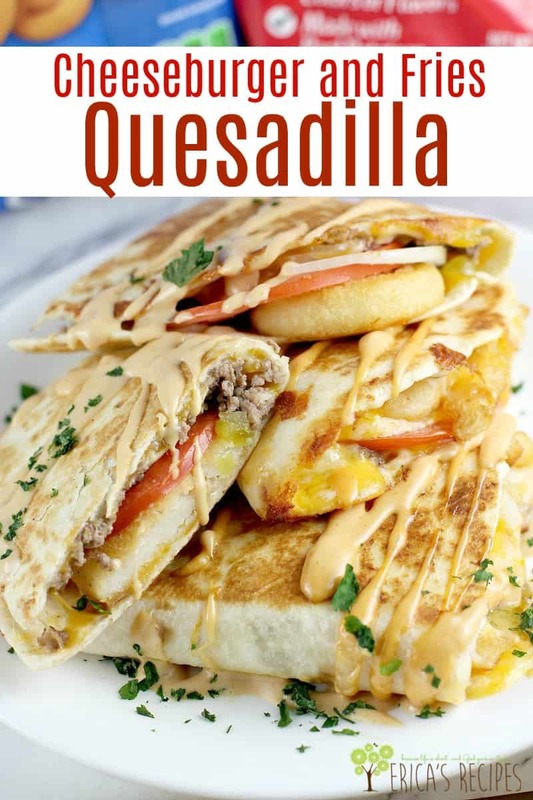 There are two ways to serve the burger sauce with the quesadillas. One is to drizzle it over like I did for these photos. The other (and probably the way that will work better while game-watching) is to keep the sauce on the side for dipping the quesadilla. Either way, this flavor combination is so winning. So that’s it folks. 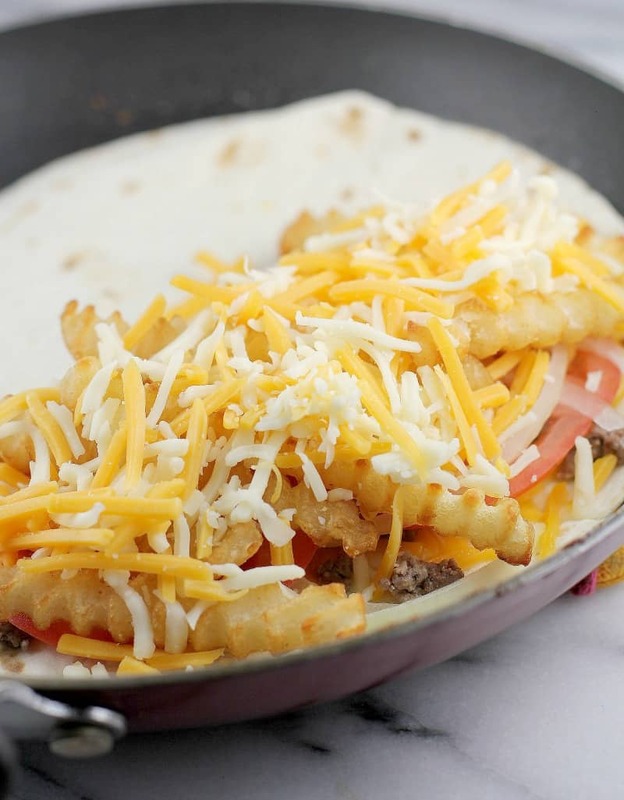 A fun recipe idea, gameday perfect. Delicious grub and easy to up a bunch of it. 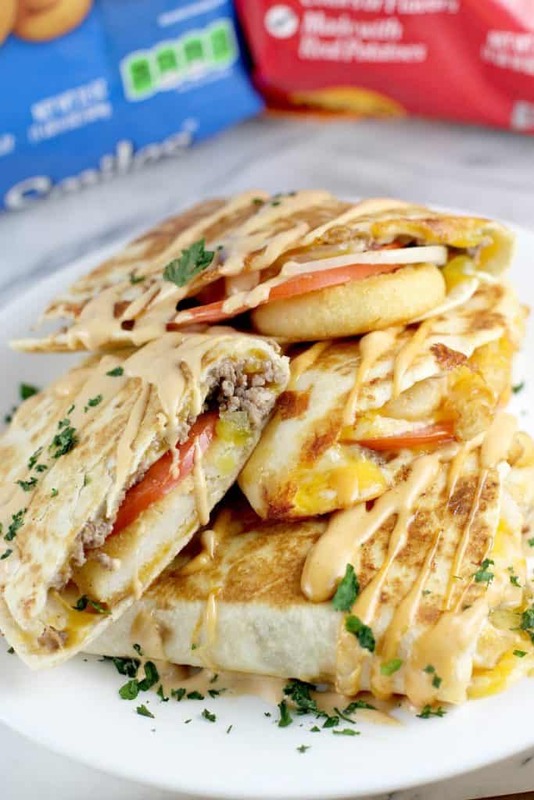 Cheeseburger and Fries Quesadilla! 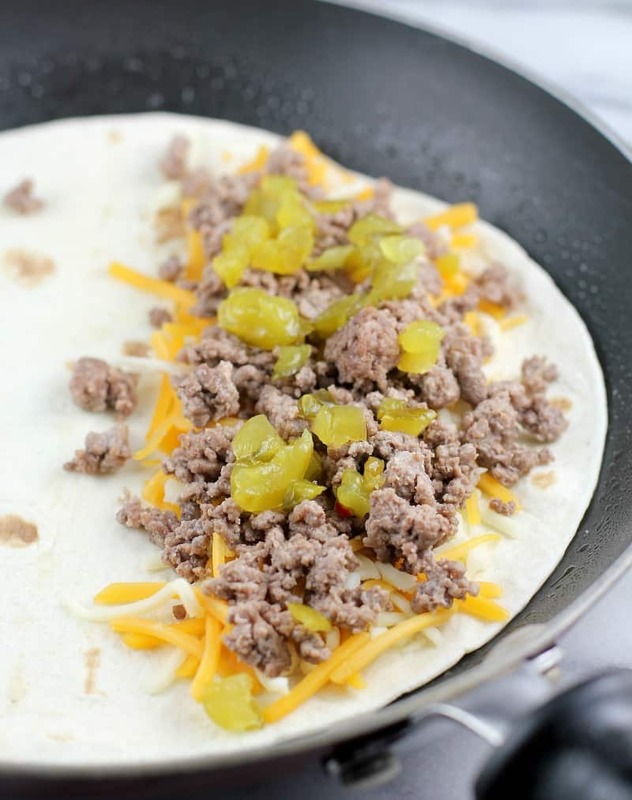 Combine the cooked ground beef with the mayonnaise, sour cream, salt, garlic powder, and black pepper. Set aside. 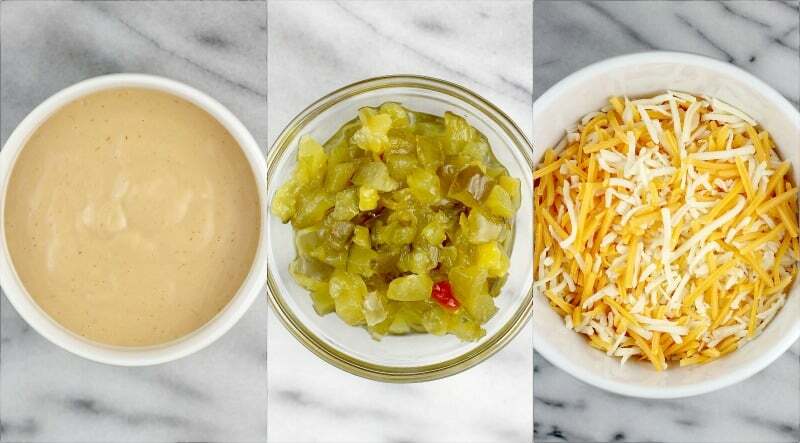 Combine the ingredients for the burger sauce. Set aside. Heat a large or medium nonstick pan over medium-high heat. Spray well with cooking spray. Lay a tortilla in the pan. One one half of the tortilla, layer cheese, meat, pickle, more cheese, onion, tomato (2 slices), and more cheese. 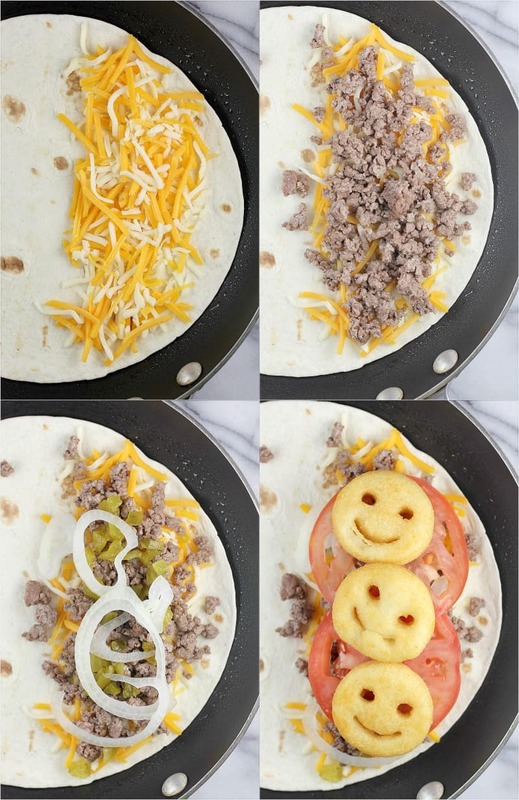 Use thongs to fold the side of the tortilla without toppings over onto the toppings forming a half circle quesadilla. Cook gently until underside is golden and toasty. Carefully flip the tortilla (I find using two rubber spatulas, one on either side, works best) to toast the other side. Serve tortilla with Burger Sauce. Yields 6 servings. Purchased substitutions for the burger sauce include descriptions such as burger sauce, mayochup, fry sauce, or secret dipping sauce. Leave me a comment! Do you try fun recipes like this? Also, remember to check out the rebate for McCain potato products.